Week 3: I ran in Bangkok today…. Today’s forecast? 99% humidity with a high chance of vomit. OK, so, I did not really run in Bangkok. I ran in my hometown, Chapel Hill, North Carolina, but it might as well have been Bangkok. I met my running group at Fleet Feet for an 11 miler this morning at 7:00. We, incorrectly, thought, that by starting at 7:00, we’d be beating the heat. Nature must have laughed at that. Before the run, Kylah checked the weather on her phone – 99% humidity. No, I am not making that up. Also, the weather icon was waves. None of us had ever seen that before but we decided that it signified steam. Like the steam coming off the road. Off we headed. 1 mile into the run, Nancy, who runs “naked” (yes, she has clothes on – she just does not run with a watch or an app on her phone) asked us how far we had gone and when she heard we’d only gone one mile, I think she cried but it was hard to tell because of all the sweat on her face. The rest of us were mentally cussing. I wish I could accurately put into words the misery that was the run. Even my shins were sweating. There were four of us. We have all run half marathons, marathons or competed in Ironman 70.3 races. We are not novices but we might as well have been taking our first running steps, we struggled so hard. Dimity, my coach, had suggested to me that I swallow my pride about running full distances and interject some walk breaks into my runs but I resisted. This morning, I asked for walk breaks, feeling bad about dragging the group down, but they all agreed. I think it was the only thing that saved us all from falling down in a steamy puddle on the ground like the witch in the Wizard of Oz!! We still managed a decent pace. At about mile 8.5, I suddenly developed a horrible headache and felt nauseated. I seriously thought I was going to throw up. It was the closest I have ever come to actually puking while running. I had to interject a few more walk breaks. I looked like I had jumped in a swimming pool – my tank top was literally so wet, I could ring sweat out of it. My group had planned to run 9 and go for coffee while I ran my last 2 miles. When we got back to the parking lot, I stopped at 9 miles, missing the last two of my 11 mile run. Of course, I felt horrible about bailing on the run. I spent the (iced) coffee hour obsessing about my inability to run 11 miles when I’ve run 13 before. After we parted ways with the rest of the group and Sissy and I were walking back to the car, I admitted to her that I thought I had lost my running mojo. That I was not going to make it through marathon training. She confided that she felt the same way about her running. I said, maybe, it was the heat. She was not so sure. We had to stop in Fleet Feet for a few things and it turns out, Jerry, our half marathon coach was working this morning. We mentioned to Jerry how we felt and he said it was definitely the humidity. Jerry is like a running genius – he can answer any and all questions about running. He said that running in high humidity is the same as running at altitude. Your body tries really hard to produce more more red blood cells to help you breathe. Your body makes extra sweat that cannot evaporate. 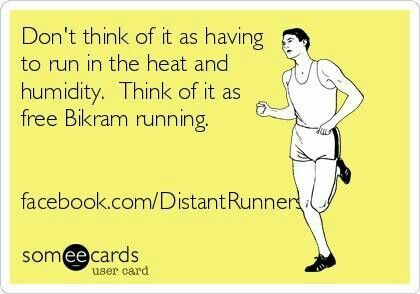 The good news is that he said, once it cools off, we’ll basically be total badasses who can run at least 30 seconds per minute faster because we spent all this time training in miserable conditions. When I got home, I found a good article about running in high humidity on Runner’s World. It turns out that, if you run long distances in high humidity, you can become dehydrated so your body pumps more blood to your essential organs, leaving your stomach to fend for itself so, many runners feel nauseous. Bingo! If you keep running, you may get dizzy. Bingo! They suggested that I run on a treadmill if it is that humid, again. RW, I think you might just be on to something! Instead of beating myself up, I guess I am proud I managed 9 miles in some of the worst conditions I’ve experienced in my brief running career. The next time we’re slogging through through conditions like a country in Southeast Asia, I’ll just remember the badass runner I am going to be in Philly in 53 degree weather and low humidity! Maybe, I’ll go out for Pad Thai tonight!